He is, we’re told in the opening of the first volume, “The Genius of Crime.” Not a genius, the genius. And he doesn’t play nice. In the standard English translation, the last line sounds exceptionally scary, especially today. The original French, “Il fait peur,” is closer to “He creates fear,” but that sounds tamer in English than in French. In whatever language, for a hundred years this catechism has proven bone-chilling. Cinephiles, crime fans, avant-garde artists, and mass audiences have found the tales anxiety-provoking, even hallucinatory. The delirious imagery and plot twists are felt to harbor a demented poetry. 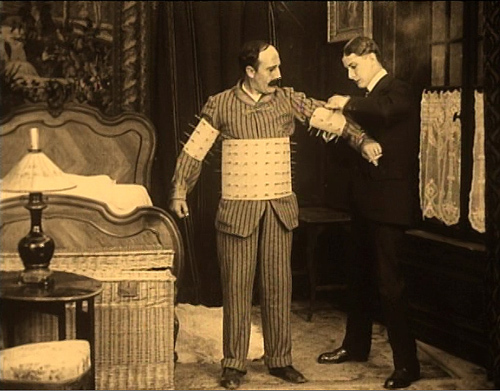 So the first reason to celebrate the arrival of a U. S. DVD version of Louis Feuillade’s great installment-film Fantômas (1913-1914) is that we can all have a look at what made Apollinaire and Magritte and Resnais and Robert Desnos tremble. I confess myself of the other party. I enjoy tales of Fantômas and Dr. Gar-el-Hama (the Danish equivalent in movies of the era) and Dr. Mabuse and Haghi (of Lang’s magnificent Spione, 1928) but they don’t give me an existential frisson, or unmoor me from rationality, or make me feel the secret currents swirling through the modern city. Call me cold-blooded. On second thought, don’t. The best-made efforts in the master-mind genre do heat my blood—but because they arouse my love of narrative invention and dazzle me with flourishes of cinematic style. The conventions of the genre, all the disguises and elaborate schemes and surprising revelations engineered by the Genius behind the scenes, the cascades of coincidence and the hairbreadth escapes, aren’t merely enjoyable in themselves. They show how little plausibility matters to storytelling. (People may say they like realism, but they’re suckers for far-fetched stories.) And in order to make the whole farrago of traps and conspiracies flow along, you need filmmakers who can hold our interest with swift pacing and ingenious narration. 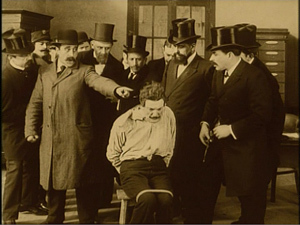 On many occasions, depicting virtuosity of crime has called forth virtuoso cinematic technique. So let Fantômas make your flesh creep, if your flesh is creepward inclined. 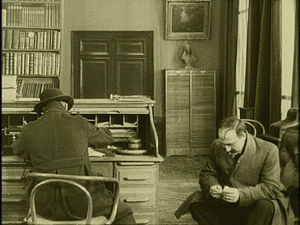 But even if it’s not, we should celebrate Louis Feuillade’s triumph in creating, in the first great era of filmmaking 1908-1918, a fine piece of cinematic storytelling. To appreciate it, we need to watch—really watch—what he’s doing. Thirty-two Fantômas novels by Marcel Allain and Pierre Souvestre were published from 1911 through 1913. 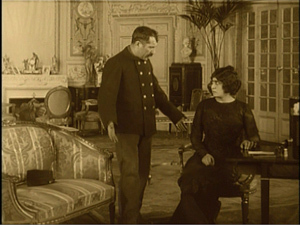 By the time Feuillade launched the film version in May of 1913, the book cycle was winding down; in La Fin du Fantômas (1913), the master criminal dies, at least for a while. 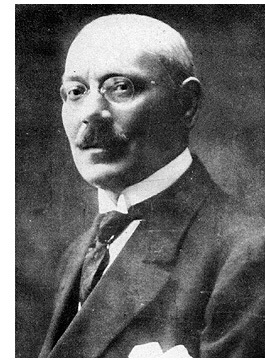 Souvestre died in 1914, but the prodigious Allain revived the series and the villain during the 1920s. When the films were made, Feuillade was working for Gaumont, one of the two most powerful French studios. He was head of production, overseeing other directors while turning out his own movies at a rapid clip. He signed over fifty films, mostly one-reel shorts, in 1913 alone. The Fantômas films are often thought of as a serial, but they are really long installments in a series, somewhat like our Bond and Bourne franchises. A “feature” film at the period might run fifty to seventy-five minutes. As with our franchises, there are recurring characters. The films pit police inspector Juve and the journalist Fandor against Fantômas and his accomplices, notably the treacherous but passionate Lady Beltham. Feuillade was one of the great directors. 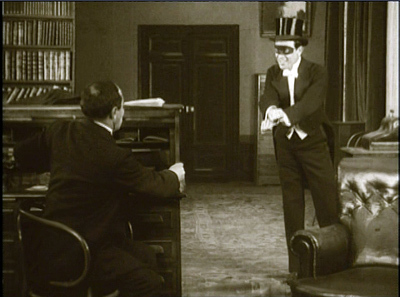 He had a fine comic touch, not only in the shorts featuring child players like Bébé and Bout de Zan but also in farcical two-reelers like Les Millions de la bonne (The Maid’s Millions, 1913). 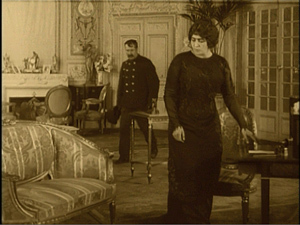 His dramas could be powerful too, epitomized for me in the two-part feature Vendemiaire (1919) and sentimental melodramas like Les Deux Gamines (1921) and Parisette (1922). Still, he’ll probably always be most famous for his crime films like Les Vampires (1915-1916), Judex (1917), Tih Minh (1919), and of course the first of them, Fantômas. The new video edition, which comes to us from Kino, is the third DVD release I’ve seen. The first was a French set from Gaumont in 1998, the first full year of the DVD format. The box contains a handsome booklet with background material, pictures, and an interview with Feuillade, but the intertitles aren’t translated. All subsequent releases seem to be based on the Gaumont copy used in this collection. That results in so-so picture quality, a rather haphazard score pasted together from classical pieces, and occasional distracting sounds, like birds tweeting in outdoor scenes. The UK Artificial Eye PAL release of 2006 includes a brief introduction by Kim Newman but no booklet. 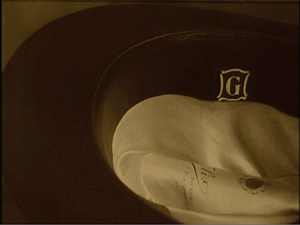 The original Gaumont titles are preserved, with English subtitles added. Kino’s version unfortunately eliminates the French titles altogether, substituting English translations. Visually, however, I prefer the Kino version to the others, which on my monitors is less contrasty and heavily saturated in its tinting. Still, the Gaumont master was made in the early days of DVD authoring and could stand a complete redo. In fact, Gaumont should release many more Feuillade titles, starting of course with Tih Minh. How best to persuade you that these movies are worth watching? I decided to concentrate on just the first episode, Fantômas (aka The Shadow of the Guillotine) as a sample of Feuillade’s artistry. Everything I analyze here is on display in later installments, sometimes more flamboyantly. The creative principles at work are explored in greater detail in my books On the History of Film Style and Figures Traced in Light (which has a long chapter on Feuillade), as well as in several items on this site. 1. Get ready for preposterousness. The film, based on the first book in the series, rearranges the novel’s plot order considerably and simply excises the first half’s major line of action, a hideous murder. Even with cuts, though, the film asks us to believe that after Fantômas, disguised as one Gurn, is put into prison, he can get his wealthy mistress to bribe a guard to let him out for a while. And that during their rendezvous, the couple can replace the murderer with an actor who happens to be playing Gurn in a stage show based on the case. And that the actor, having been drugged, can’t recall his identity. There’s at least one glaring plot gap in the film. Juve solves the mystery of the disappearance of Lord Beltham when he discovers his body in a steamer trunk about to be sent overseas. The novel explains his rather tenuous line of reasoning (Chapter 11), but the film simply shows him arriving at Gurn’s apartment and examining the fatal trunk. Presumably, though, Feuillade could afford to be elliptical. Some of the audience would have known the novels and could fill in bits that seem enigmatic to us. The film’s climax is in fact less implausible than the novel’s, perhaps out of considerations of good taste. In the novel, the actor substituted for Gurn actually dies at the guillotine; the authorities realize their mistake only when they see the head smeared with greasepaint. In the film, Juve interrogates the dazed Valgrand and astounds other officials by revealing that he isn’t the prisoner they had locked up. Even then, it seems unlikely that nobody but Juve would have noticed the prisoner’s wig and false mustache. Far-fetchedness is built into the genre, so the problem is handling. Craziness must be treated matter-of-factly, and Feuillade’s sober technique takes all the wild developments in its stride. Nothing fazes Fantômas, or our director. 2. Accept the conventions of “pre-classical” cinema. 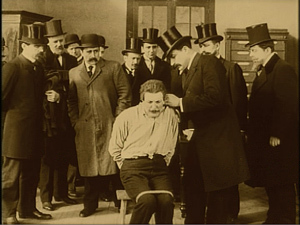 Film historians often consider the years from 1907 to 1917 as leading up to the sort of cinematic storytelling we know, replete with lots of cutting, close-ups, and camera movements. 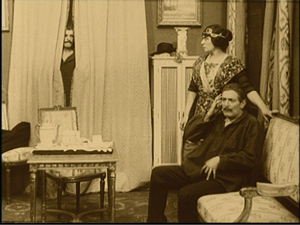 A film like Fantômas exemplifies some tendencies of French cinema in this period. There is relatively little crosscutting among lines of action. The film uses no shot/ reverse-shot or extended passages of close-ups. Typically a cut is used to enlarge printed matter, like a news story or a business card, or to emphasize crucial details. Here is Juve discovering a clue, Gurn’s hat, in Lady Beltham’s parlor. 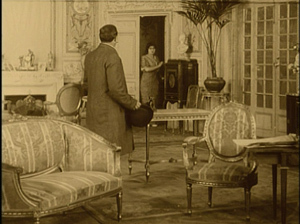 Interior sets were usually designed to be seen from only one camera orientation. In exteriors, we get somewhat freer cutting, presumably because real surroundings don’t confine the camera as much as a fake set does. In this transitional era, some habits of earlier years hang on: the fairly distant framings, the fairly obvious sets, and the occasional glances at the audience. You can almost sense stylistic change happening during such moments. In earlier films, characters constantly looked at the audience, but in Fantômas a character’s eyes pause fractionally on us before drifting away, as if the look to the camera simply signified thinking, not an effort to share a response. Similarly, Feuillade seems to be sensing the need for varying his camera positions in a way that we’d find in later cinema. Consider his handling of the Royal-Palace Hotel. To show the elevator entry on different floors he reuses the same set. This is motivated realistically, since hotels look more or less the same on different floors. But if the camera were framing every elevator shot exactly the same way, we would have weird jump cuts when cutting from floor to floor, and the use of the same set would be more apparent. 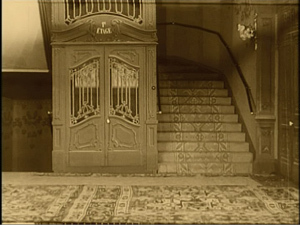 So Feuillade not only re-labels each landing at the top of the frame, but he shifts his camera position slightly, moving the framing rightward in the string of shots showing the elevator descending to the ground floor. The slight shifts in framing reinforce the sense that we’re on different floors. 3. Watch the back door. 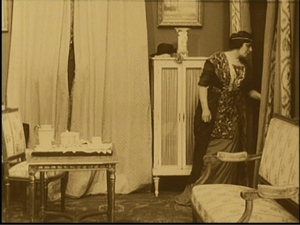 Deep space is common in exteriors from the beginning of cinema, even in Lumière shorts, but by the early 1910s filmmakers were starting to replace relatively flat interior sets with ones that give their actors more playing space in depth. Here, for example, is a Bohemian party from Feuillade’s Une Nuit agitée of 1908. The parlor and the action are shot in a flat, lateral way, and people enter the room from the right or left. 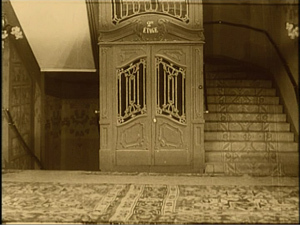 Compare the depth in the interiors of many scenes in Fantômas of five years later. Once sets become deeper, the rear door becomes very handy for entrances and exits, and Feuillade is a master of using it. It’s usually fairly close to the center, but in the actor Valgrand’s dressing room, it’s off to the side. 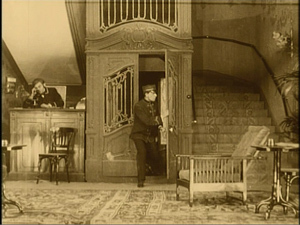 The rear door prepares us for upcoming action and provides another center of compositional interest—advantages that don’t come up when actors enter from the sides of the frame. The door also allows people to be shown overhearing what is going on in the foreground. Valgrand’s gestures are broad ones, suitable to being seen from a great distance. But in the surrounding story, the performances are much more subdued. Feuillade demanded dry, quick acting from his players, and their gestures aren’t extravagant. (Juve usually jams his hands in his overcoat pockets.) 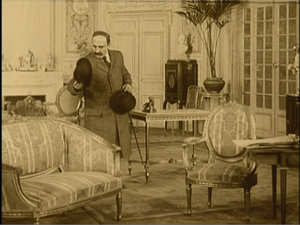 Instead, Feuillade keeps his actors busy with small props. Here, as Fandor writes a story, Juve is brooding on his failure to capture his adversary. Before he’s finished one cigarette he’s already rolling another, and he lights up the new one end to end. Crucially, theatrical space is geometrically very different from cinematic space, as I’ve argued in several other entries. A shot like this wouldn’t work onstage because spectators sitting to the right or the left would have their sightlines blocked by furniture. Because the camera slices out a wedge of space in depth, actors can be carefully arranged in dynamically developing compositions that would not be visible on the stage. When the doped-up Valgrand is brought to be questioned by the police officials, we first see him through the rear doorway–a view that wouldn’t be shared by many spectators in a theatre performance. The dazed actor is questioned, with Juve emerging slowly out of the welter of authorities behind him. Needless to say, the earliest phases of this shot would be unintelligible on a stage; for most members of the audience, the other actors would block Juve. Recall as well that this was accomplished in an era when directors and cinematographers could not look through the lens to see exactly how the configuration would appear onscreen. 5. Develop an appreciation of complex staging. In a cinema relying on analytical editing, our attention is driven to one item or another through cutting and closer views. 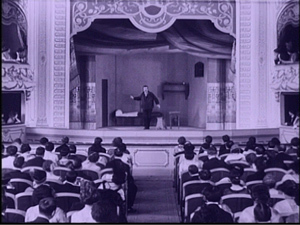 By contrast, the director of “tableau cinema,” as this 1910s style is sometimes called, must shift the actors around the sets in ways that call our attention to what’s important at each moment. In the course of the scene, the director must also try to maintain some pictorial harmony on the two-dimensional plane of the screen. Shots are subtly balanced, then unbalanced, then rebalanced, all in the service of story intelligibility. As we’d expect, depth can play a key role here. Take the simple moment when Lady Beltham’s butler announces the arrival of Nibet, the prison guard whom she bribes. Lady Beltham turns at the sound, rises, and moves to the settee. As Nibet enters, Lady Beltham returns to her writing desk. This is our old friend the Cross, refreshing the image by having the actors trade placement in the frame. The same choreography of balancing, unbalancing, and rebalancing can be found when the characters aren’t arranged in depth. The scene of Lady Beltham and Gurn drugging Valgrand plays out laterally. Gurn hides behind a curtain, and our awareness of his presence there colors the whole scene. But because Valgrand will be on the settee, for some while Lady Beltham’s position at her tea table would make an appearance by Gurn compositionally clumsy. As the drug takes effect, Lady Beltham moves to Valgrand’s side. This gesture of concern unbalances the composition–until Gurn peeps out to rebalance it. Lady Beltham’s stare at him makes sure we notice his presence. Soon the police arrive to return “Gurn” to his cell. Again Lady Beltham moves to the right, and again it’s motivated: She wants to make sure the cops have gone. But that movement clears a space for Gurn, i.e. Fantômas, to reveal himself in triumph just as Lady Beltham relaxes in relief. The synchronization demanded of the actors, in pacing and placement, is considerable, and of course the director has to coordinate everything. 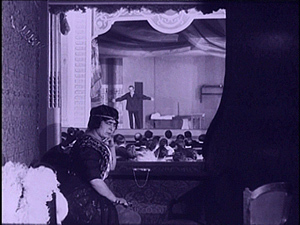 Feuillade, directing with shouts and a drillmaster’s whistle, drove his actors through each long-take scene. Turn off the music occasionally and imagine him calling out instructions to them. These examples, and many others, gainsay David Kalat’s curious claim in the Kino commentary that Feuillade’s work exhibits an “anti-style” that doesn’t present stories “cinematically”–because he doesn’t exploit cutting and changes of camera position. 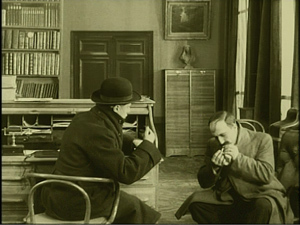 The camera has been plopped down perfunctorily in front of a set in which the actors meander around within the frame without any sense of composition. In several scenes the actors nonchalantly turn their backs on the audience completely. Only rarely does a shot appear in which the actors seem positioned in front of the camera for any specific pictorial effect. The shots ramble on with hardly any change of point of view until the scene ends and a new one takes its place (Disc 1, 11:54-12:20). Actually, here and in other works, Feuillade’s staging is quite precise. I doubt that many directors today could block fixed shots as fluidly as he does; sustained, intricate staging in this sense is an almost lost art. Hou Hsiao-hsien, in his films up through Flowers of Shanghai, might be the last great exponent of this technique. Granted, it’s hard to study the films as they’re unfolding. That’s partly because Feuillade guides our eye so subtly that we get caught up in the plot. Still, re-viewing can help us spot the fine points. With this DVD set, you have at least five and a half hours of fun before you. 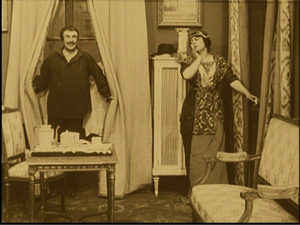 In the lurid tales of Allain and Souvestre, Feuillade found sensational material. He had fine actors. He had luminous prewar Paris as a backdrop. And he had at his fingertips all the resources of tableau cinema. The whole mixture creates a lively cinematic experience. 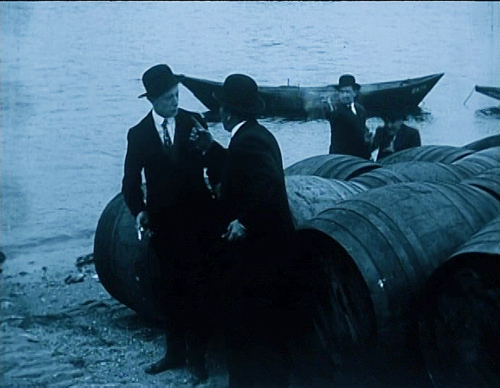 Watching films like Fantômas and Ingeborg Holm and The Mysterious X and many others from 1913, we can still be bowled over by their exquisitely modulated storytelling. If Feuillade is less baroque than Bauer and less poignant than Sjöström, he’s also more brisk, laconic, and playful. Call him the Hawks of the tableau tradition. Thanks to this new release, more Americans will have a chance to enjoy his exuberant creativity. And they can have all the frissons they want. Searching “tableau” in our blog entries will offer many further examples of what I’m discussing here. Our 1913 entryoffers an overview of what Feuillade’s contemporaries were up to. 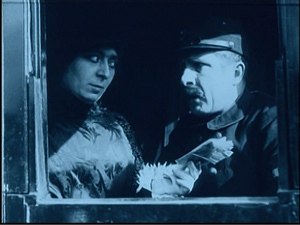 The Kino set includes two other Feuillade films, The Nativity (1910) and The Dwarf (1912). These are better transfers than the main attractions, and make for some interesting comparisons with his artistic strategies in Fantômas. There’s also a short documentary on Feuillade’s career, adapted from the Gaumont box set Le Cinéma premier, which contains many Feuillade titles. Other Feuillade films are available on US DVD: Les Vampires, in an out-of-print Image set; Judex, from Flicker Alley; and various items in the Kino package Gaumont Treasures, 1897-1913. 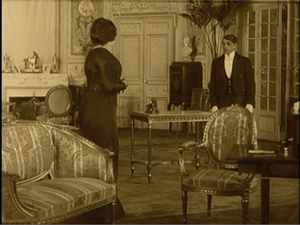 That set, a selection from the Gaumont box, includes The Agonie of Byzance, made the same year as the first installments of Fantômas. As times changed, Feuillade adopted editing, sometimes in rather flashy forms. For examples, go to my chapter on Feuillade in Figures and here. Essays by Ben Brewster and Lea Jacobs show how performance style adjusted to the tableau tradition. 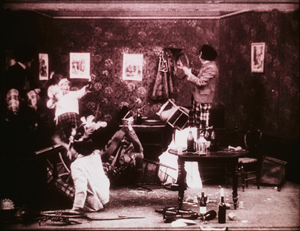 Charlie Keil’s Early American Cinema in Transition traces the somewhat differing developments in U. S. cinema of the period. For all things Fantômas, visit the Fantômas Lives website. There’s also the very helpful Encyclopédie de Fantômas (1981), self-published by the mysterious ALFU. If you want to know the percentage of deaths by defenestration in the oeuvre (6.8 %), this is the book for you. David Kalat offers a wide-ranging survey of Fantômas’ influence on modern art and popular culture in “The Long Arm of Fantômas,” in Third Person: Authoring and Exploring Vast Narratives, ed. Pat Harrigan and Noah Wardrip-Fruin (MIT Press, 2009), 211-224. Francis Lacassin has written prolifically on both Fantômas and Feuillade. 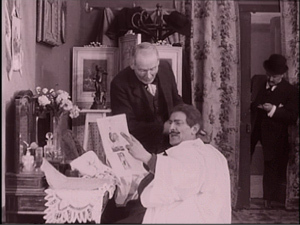 The arch criminal earns a chapter in Lacassin’s À la recherche de l’empire caché (Julliard, 1991), while his Louis Feuillade: Maître des lions et des vampires(Bordas, 1995) remains the essential work on the director. 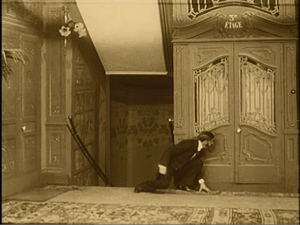 This entry was posted on Thursday | November 11, 2010 at 11:32 am	and is filed under Directors: Feuillade, Film history, Film technique: Staging, Narrative strategies, National cinemas: France, Silent film, Tableau staging. Responses are currently closed, but you can trackback from your own site.